One of many unique projects, started not long ago in Spain, as a cooperation of Jumilla based Gil family and Jorge Ordóñez. Their join mission is to find an unique land, with great vine potential and use the maximum knowledge, technology and personal effort to bring the best out of that region to the light. D.O.Montsant was supposed to be included on the Priorat appellation (it is in fact a horse shoe shaped appellation that surrounds the D.O.C. 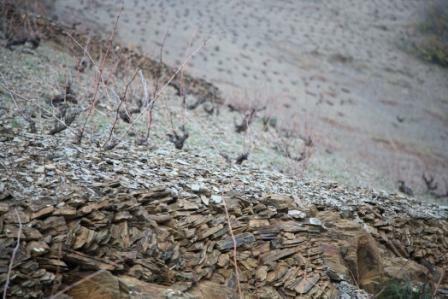 Priorat on three sides). This appellation business has certain great advantages for us, consumers: knowing the right D.O. so closed to an outstanding D.O.C. such as Priorat, you can buy super high quality wines, having the advantage of similar soil and very similar terroire with its expensive cousin – but paying much more affordable price for it. (By the way, there are only 2 regions in Spain awarded DOC (Denominacion de Origen Calificada) so far – and that’s Rioja and Priorat). Celler Can Blau is one of those unbelievably good bargains. The winery purchased 60 acres of vineyards planted around 1975 in the village of Mas Roig with vines that averages 37 years of age. 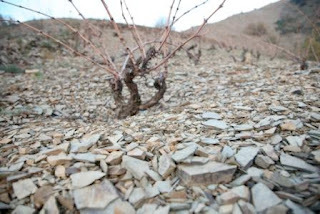 Cariñena (Mazuelo) planted on snady clay soil, Syrah on chalky soils and the Garnacha on slate. Harvest here is done by hand, strict selection of grapes follows in the winery. After a fermentation, the wine then rests for 10 months in new French oak barrels. The composition of different soils helps to create a very unique blend of wines. Combined with the perfection that each Sarah, Jorge and Gil brothers brings to the table, you have a recipe for success. This wine is a true flagship of Montsant and its varietals. Jorge Ordóñez’s passion for Spanish wines doesn’t end at the winery. His development of artistically beautiful labels has became another signature style of his company. Just look at this label! 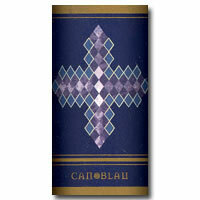 Dark purple wine with aroma of ripe blueberries or dark jammy fruit. Give this wine time to open up! It will reward you with rich flavors of dark fruit, coffee and spices. What started like medium body wine, becomes heavy duty fruit bomb an hour later, in the most positive way. Almost nonexistent, silky tannins and lovely, long and attractive finish. Retail price: around $ 18.00!! !